Who says something portable can't be stylish? Korg had the same idea when they built the MicroPiano, which began as a simple compact 61-key keyboard, but Korg began to design outside the box for a little. 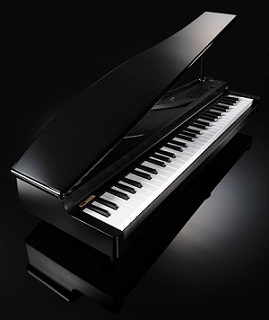 They added curves and bits of design flair like the glossy black finish and the adjustable lid to give it a hint of a full size grand piano (and maybe poking fun at its own instrument just a little). It's still hardly any larger than your average compact keyboard even with the extras added on. Oh, and it comes in white and red as well as the natural black. Why? Because it looks cool, and sometimes that's all you need. The microPIANO borrows its piano sound (and stereo piano samples) from Korg’s flagship digital pianos. In total, there are 61 sounds available; Korg is definitely going for quality over quantity here. Keyboard sounds go beyond the traditional pianos to include your standard lineup: electric pianos, harpsichords, accordion, celeste, organs, clav's, et cetera. There's one oddball that I'm really pumped about, though. The Korg will include several samples of toy pianos loaded into the MicroPiano library; that's something I don't think I see enough, and Korg gets points for that. In addition, there are also flutes, strings, harps, bells and mallet percussion sounds – marimbas, vibes, steel drums, even kalimbas and music boxes. Of these 61 sounds, 25 are what Korg is calling "Short Phrase Sounds." These can automatically generate phrases simply by holding down a key, like an arpeggiator that creates the arpeggios for you. For example, piano sounds can provide a left-hand accompaniment in the lower range, allowing the melody line to be played with the right hand; organ sounds come complete with phrases from famous pipe organ compositions. I'm still not entirely clear as to what these sounds can do, but hopefully more will be revealed in the near future, perhaps with a test piano. The “Natural Touch” keyboard provides "61 mini-keys proportioned to provide both the skilled player and the novice with a comfortable playing experience," says Korg's press release, so we can assume they're slightly smaller. The touch-sensitive keys are shaped in the traditional grand piano style, with square fronts and overhanging lip, another feature that we don't see often in compact pianos, but one which is becoming increasingly prevalent. Thanks to better technology and machining, this is becoming easier, and therefore cheaper (hooray! ), to do. The MicroPiano can hook up to a headphone jack for practice, play through built-in speakers to entertain friends, or plug into a full-size amplifier for live gigs. Given the source of Korg's tones, I believe that their claim that this is a gig-worthy keyboard is legitimate, but I'll withhold my full opinion until I play one, which will hopefully be soon! And I can play one no matter where I'm at, because it runs on batteries, too. Having one less cord in my live rig would be a blessing, indeed. The microPIANO (Red, Black or White) will be available February 2010 with a U.S. MSRP of $500.00. For more information, please visit Korg's website.